In April, the report of plastic bag eating caterpillars caused sensation in worldwide media. The authors around Federica Bertocchini of the University in Santander had reported that the larvae of wax moth Galleria mellonella were able to digest polyethylene (PE). This polymer is mainly used for making plastic packaging and bags. Co-workers of Till Opatz, professor for Organic Chemistry at the Johannes Gutenberg University Mainz (JGU), now critically examined the released data and experimental procedures by Bertocchini et al. and published a counterstatement. According to their report, a sufficient proof for the bio-degradation of polyethylene is missing in the first publication. It all started when the Spanish authors had accidentally observed above named caterpillars biting holes in shopping bags. The researchers now investigated whether it is actually a matter of a biochemical digestion by enzymes and/or bacteria in the caterpillars’ digestive tract or simply a mechanical milling. In the latter case, the plastic would be excreted chemically unchanged. The group developed an experimental procedure, in which the influence of caterpillar homogenate on a polyethylene surface was examined. The homogenate is a mass of deep frozen and squashed caterpillars, rich in proteins and lipids and with intact enzymes from the digestive system. 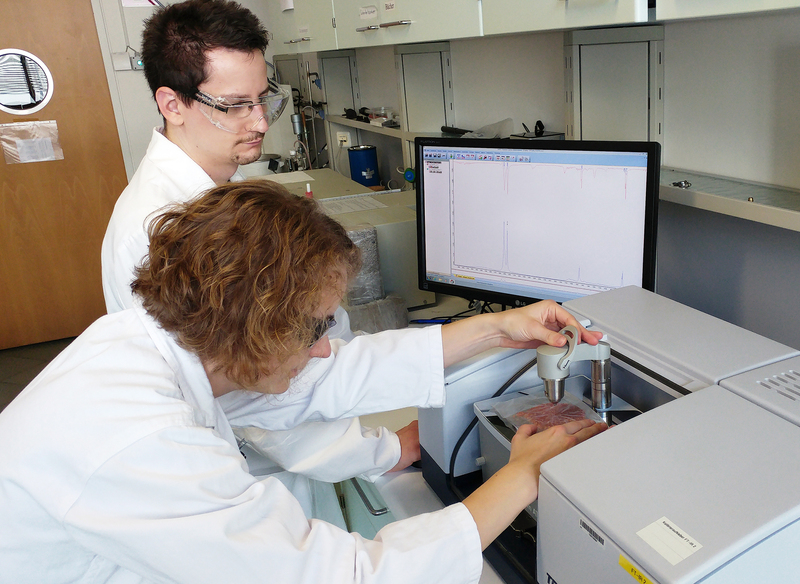 They chose spectroscopic and microscopic evaluation methods for their analyses. Bertocchini et al. report a decomposition of polyethylene into ethylene glycol, a potential oxidative metabolite, after the treatment of polyethylene bags with caterpillar homogenate. However, particularly the interpretation of the results obtained by infrared spectroscopy are questionable and doubts arouse about the actual detection of ethylene glycol. The group of Opatz now demonstrated in simple control experiments which had not been carried out by the Spanish scientists that essential signals of ethylene glycol are missing in the previously published spectra. On the other hand, the reported signals of the assumed biochemical degradation products are identical to signals caused by an animal protein-fat mixture, as they would arise from caterpillar residues on the surface. To test this hypothesis, Opatz et al. treated a polyethylene surface with egg yolk and ground pork which produced highly similar spectral signatures. The results of the German scientists were published as an author correspondence in Current Biology, the same scientific journal, in which the first study was published. Although the biochemical decomposition has not yet been disproven, the sensational report of plastic eating caterpillars at least appears highly doubtful in the light of these results. Source: Uni Mainz, press release, 2017-09-06.